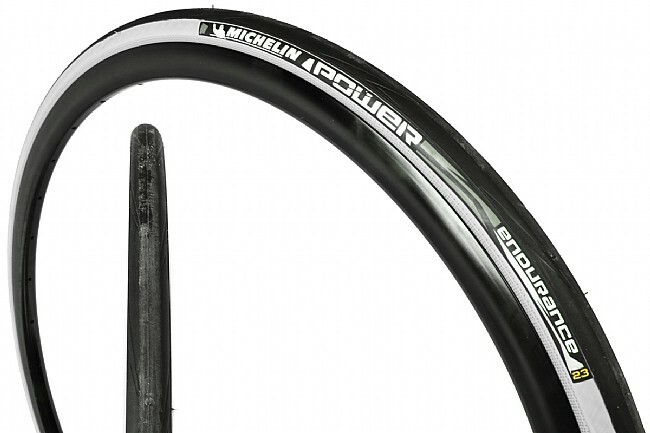 The Power Endurance road tire is part of Michelin's latest generation of performance tires, boasting improved grip, puncture resistance, and rolling efficiency over their old Pro4 range. Its Grip Design tread hooks up better in the corners and holds more speed, while the X-Miles rubber compound is more cut, abrasion, and puncture resistant while providing enhanced tire life and an 8.6 watt rolling-efficiency boost over the previous Pro4 Service Course tire. Available in multiple colors. 700c diameter. 110 TPI casing. Folding bead. Claimed weight is 220 g (23 mm), 230 g (25 mm), 255 g (28 mm). These really exceed when climbing hills. They grip wet and dry pavement very well. However, there is someone or multiple someone's breaking glass all over town in the bike lanes. One night I couldn't avoid it because one of those super wide suv's was passing, and a these were no match for glass. Also, during the winter they dump gravel all over the bike lanes, and I feel way more comfortable in my other bike with the protek cross tires on it going over all that gravel. These were super tight and hard to get in, and now that I need to get it off, I need to get new tire levers as the ones I had won't fit. On smooth rides without problem roads I think I would like these. But I didn't even make it av week without a flat on problem roads. Very supple and noticeably light! After 900 miles wear is fine (I commute with 15lb pannier & rack, and currently weigh 155lbs). These tires 'feel' fast perhaps due to the lightness. The tire did hold up well after glass cuts. The cut never spread widely, but remained just a bit small. Perhaps the 'Endurance' is more for the tread life vs. ability to withstand punctures. These are good fast tires, but too much time spent repairing flats to keep them on. Recommend if your commuteride is debris free, otherwise look elsewhere. I really like these tires. I heard others say they had problems with mounting them but that was not the case with mine. From the very first ride i was sold. I wouldn't hesitate buying these. The roll and feel is outstanding. Can't go wrong with the Michelin Endurance, rolls nice, pump them up to 8 bar. Go with the 25C or 28C. Very quick delivery on these tires. They look great, easy to install. Only been on a couple rides so cant say much on longevity. First rate ride , handling, I have had no punctures get 13 to 15 hundred miles before ware indicator says change. Very good tire. I purchased these for Fall and winter as they have a better puncture resistant makeup when compared to the Comp. So far they have great grip and very light weight with no punctures to date. The small amount of tread there is can be found on the sides of the tire and good for mixed road conditions. If you ride in the rain and snow I would look for their next model that has more tread and designed for these conditions. Love this tires, great performance!! very hard to mount,I also destroyed a tube mounting them .They are still holding air in my basement. I don't want to ride them , I am afraid of having a flat out on the road. Blows away the gator skin cement tires that are hard as rocks and made my back and neck ache. Michelins break in fast and out handle the competion especially on technical downhill joints. Awesome in heavy rain also. finally on the road ! road riding some ruff Finally got the bike out of the basement ,rode 34 miles no flats Thank God ! tires felt very firm at 98 psi, I'll try a lb or 2 less next ride. Michelin has certainly improved this tire, I use them for bike commuting and even in the rain they grip great! With 100 miles on these tires, there is no sign of wear. The downside is that I would not want to change a tube on the side of the road. Installing them at home, I pinched two tubes and resorted to using Schwalbe Easy Fit to get them on. Even then, I had to stretch the last part on with a tire lever. I lost the Schwalbe One's I replaced to a rock strike on the sidewall. These tires have a very similar road feel and, hopefully, better durability. The Michelin Power Endurance lives up to it's name. These tires are on my road bike. I like the durability of the tire. I ride on the shoulder of many county roads in my area. Most of them have quite a bit of gravels and debris. Plus, the tire hold air for longer periods much longer than other brands. In 15 years and nearly 60,000 miles of year-round road cycling, I have exclusively used Michelin tires! Fast yet resilient and they are easy for me to change - even with the 23 mm size. I love the blue color as it matches my Cervelo's color scheme perfectly! Faster. Not sure. New personal best...yes. Tires are smooth rolling and seem faster than old pro 4 tires. Also seeing PRs all over roads I have ridden many times. So I guess that speaks for itself.